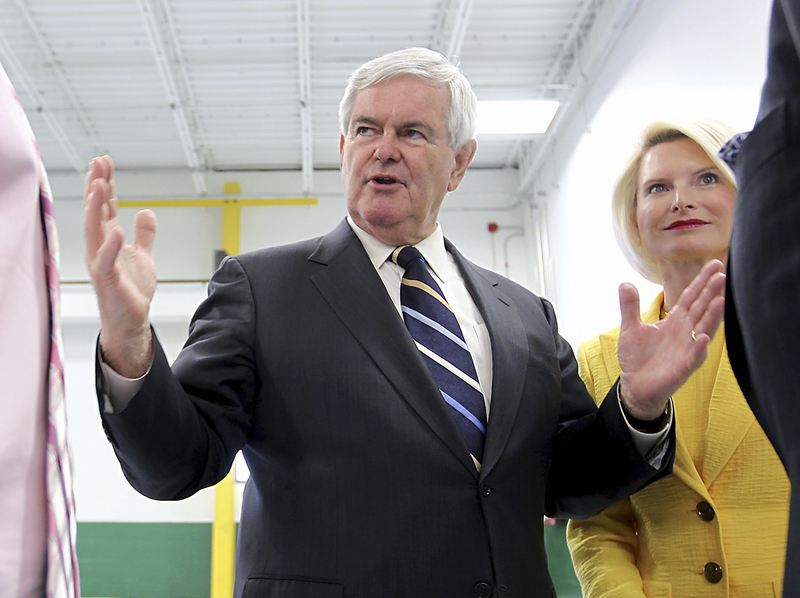 Newt Gingrich vows to win his way in 2012; Can it work? NEW ORLEANS - Based on the music playing when he came out on stage at the Republican Leadership Conference Thursday night, it seemed like Newt Gingrich might have been humbled by his horrendous campaign rollout and subsequent staff exodus. At conferences like this over the past year, Gingrich has emerged to "Eye of the Tiger," often strolling through the audience like a rock star as the song blared over the loudspeakers; Thursday evening, however, he emerged to a short snippet of "Don't Stop Believing" -- a seeming wink to the embattled state of his campaign. Yet once he began speaking, it became abundantly clear that Newt was not a new man. If possible, in fact, he was more Newt-like than ever. Anyone who has seen Gingrich in person knows he has the bearing of a longtime - and somewhat impatient - professor; he likes to extend his hands away from his body, arms straight and palms up, striking a pose somehow both regal and exasperated that not everyone understands the truth of his words. This was a classic Gingrich appearance: He vowed that he would run the most positive campaign in American history while lobbing bombs about President Obama's "secular European socialist" beliefs, support for "the opposite of freedom" and overall utter incompetence. A vote for Democrats, he said at one point, is a vote for servitude. Gingrich said one Texas judge should be fired for a ruling on prayer in school, adding that he "would eliminate the 9th circuit" for good measure. Pointing to the Federalist Papers to defend himself against those who would point to separation of powers, he said the writers believed "the judicial branch is the weakest, not the strongest." Gingrich did - unlike many of the other speakers Thursday - lay out his ideas. And Gingrich being Gingrich, there were plenty of them. He said he would eliminate the capital gains tax and lower the corporate tax rate to 12.5 percent; repeal the financial reform bill; replace the EPA with the "environmental solutions agency"; ensure America doesn't pay for abortions overseas; and, in the process, create 25 million new jobs. But the ideas seemed almost beside the point considering the status of his campaign, which appears to have effectively scared off all but the most dedicated donors. Another reporter at the conference pointed out to me that Gingrich is attempting to run the first successful "post-consultant campaign" in modern political history. But it's more than that: His campaign, at this point, is bordering on post-reality. Consider: In his speech Thursday, Gingrich vowed to "shock the media" with a "big philosophical campaign" - one that did not rely on sound bites or attack ads. And while many Americans (including this one) would love such a campaign, the reality is that sound bites and attack ads exist because they work. And whoever wins the Republican nomination will most likely traffic in both. But Gingrich isn't willing to acknowledge as much, just as he was unwilling to acknowledge that taking a two-week cruise in Greece while his campaign was imploding wasn't a great idea. According to his staff, he doesn't want to focus on campaigning or messaging; he seems to think rousing speeches are enough to win elections. It's possible that he's right - that the rules of modern politics and modern media don't apply to him in the way they do other politicians. But it's hard to see a path to the nomination that involves voters spending 45 minutes listening to Gingrich made his case, particularly when his rivals have more money, more grassroots buzz and more establishment support. And all the ideas in the world aren't going to change that.